The Yakob-Tson Lady Jane rug mentioned in an earlier post became a table runner. The Lady Jane (owned by Perfect Spot in NC) is approaching her 25th birthday and doesn’t have as much wool as she used to. Try as I might, I finally had to realize that there was not enough wool to finish the 24″ wide rug I’d started with her wool. For some reason, a square rug just looks weird to me. Her wool is lovely – light and fluffy and a bit short. Because of the length, it took a little thicker piece of fleece for the weft. In retrospect, I could have used a closer sett. I have excellent hind sight! The decision was made to unweave the rug and cut the width down to 12″. Lady Jane is a wonderful old girl, who shows great-great grandget registered in JSBA. 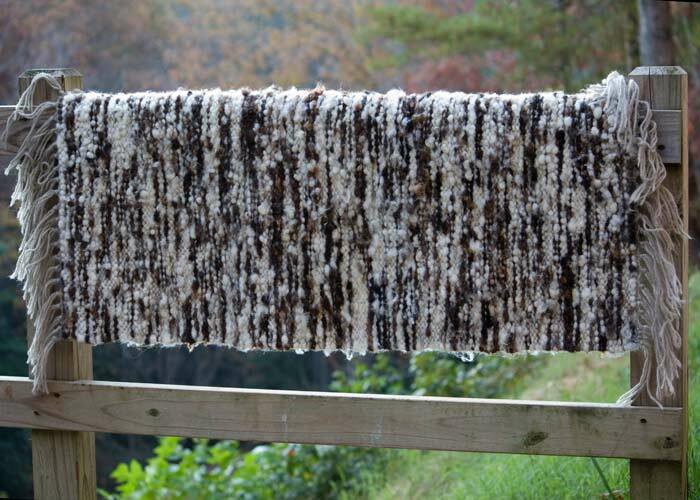 Huntsberger Isla, also owned by Perfect Spot, supplied the wool for this rug..
Isla has a nice unfreckled fleece with a really! nice luster. I had a hard time handing the rug off to Cathy today. These rugs took me way longer than they should have, even taking into consideration unweaving/reweaving the Lady Jane rug/runner. 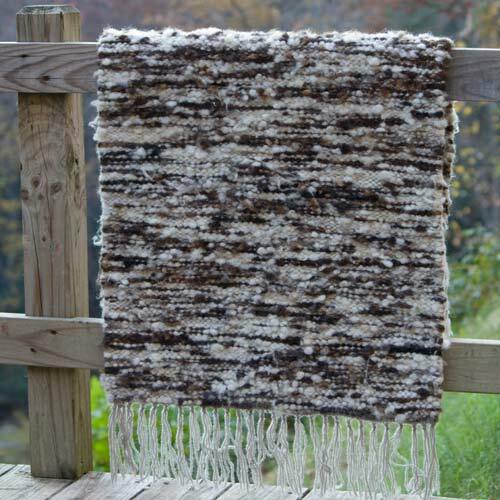 I’ve been weaving the fleece rugs on my 60″ Leclerc Gobelin vertical tapestry loom lately. I decided to switch back to my Macomber floor loom for Isla’s rug. Gosh, this is easy! And educational. You can really crank up the tension on the Gobelin – tight enough that your cuticles start to get rubbed off when you are hand laying in every lock. In real tapestry weaving, you would use a tapestry bobbin. Switching to the Macomber reminded me that these rugs do not require a warp tension that you can play music on. They are slightly felted in the washing machine after coming off the loom. I’m warped (okay, no jokes 🙂 ) on the Macomber for two more rugs, but am anxious to try the Gobelin with a looser warp tension. 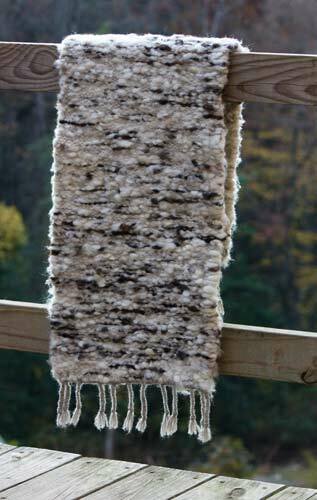 Fleece rugs are a great way to use britch wool – contact me for prices using your wool. went with Cathy and Greg Robinson back to NC and will move back to his breeder, Royal Unzicker, next month. He’s leaving Patchwork with a son and 7 bred ewes 7 bred ewes and son behind at Patchwork. Catching him up today really made me appreciate his gentle personality. 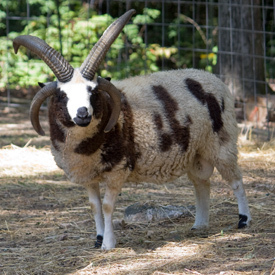 I’ve always wanted to see if roping a horn might be a good way to catch a ram over the fence. Well, I can’t rope worth a darn, although I did rope a few goats as a kid (no pun intended) and did have a rather tense moment when I managed to rope a wild hog and the other guy missed on the heeling part. Blaze was a really good horse!!!. Jedd just stood there as my rope kept missing his horns and giving me a confused look. I finally just decided to reach in and catch a horn. He politely walked to the truck to be loaded. He attracted alot of attention at Aunt Sue’s on Hwy 11 in Cleveland, SC where we met up with Cathy and Greg. If you really want to promote your sheep – park them in a busy area on a scenic hwy on a gorgeous day. But don’t order a chili dog! It was really packed, so I said I’d go get us some lunch to eat outside on one of the picnic tables. Dave wanted a chili dog with onions. I got my usual garbage dog – whatever you got, put it on. I have a really strong stomach. Dave’s chili dog turned out to be minus the dog. I hadn’t noticed when I went to order, but the chili dog doesn’t include the dog. ???? Chili on a bun? I’m still chuckling over the look on Dave’s face. I gave him the hot dog from my garbage dog and had an extra scoop of ice cream for dessert. Shari – I didn’t say that right. Jedd is leaving behind a son and 7 bred ewes! I absolutely love the rugs. The color is great and I can feel the texture from here. Would you consider teaching a workshop? Hi Linda. Great too see the SAFF photos. I always love your blog!!! Jedd is leaving with 8 others? Did I understand that correctly? Are you down-sizing? Your rugs are just fabulous, by the way! The rug/runner is just beautiful. It sounds as if you’ve really been busy with the breeding season, photography and traveling off to Asheville. Thanks for the photos of the sheep show. I like seeing the different personalities of the sheep – and their handlers! Great shots, all. If you’re free next Sunday afternoon, come up to The Heritage Center for the reception 1:30 – 3:30.